BRUSSELS, Belgium – Are the Free Trade Agreements with Singapore and Vietnam jeopardized and are Chinese companies looking for expansion into the European Union faced with a growing number of limitations? This time with duties and tariffs of the EU and the U.S. targeting Chinese exporters their import customers are probably looking for low cost sourcing alternatives. They see on the horizon a Free Trade Agreement with Vietnam beckoning. However, labour rights are still holding up the deal. It’s expected that the European Union’s Free Trade Agreement with Vietnam will grow Vietnam’s exports to the EU by 26% up to 2025 to USD 42 billion (up from USD 33.1 billion in 2016). 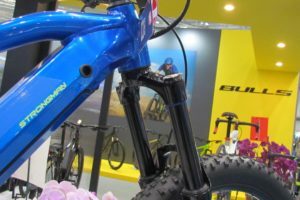 Among that duty-free export from Vietnam, to Europe will be a considerable part consisting of bicycles, e-bikes as well as parts and accessories. 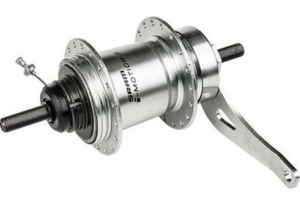 In particular as there has been a considerable built-up of bike companies in the past years. 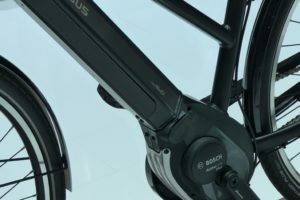 Companies from the bicycle and e-bike industry which recently invested in Vietnam are (among others) KMC, Bohle/Schwalbe, Astro, Kenda and DDK. For Bohle/Schwalbe the new Vietnam facility, which has been built with its Korean partner, brings much needed extra production as demand for its Schwalbe tyres is growing year on year. Next to extra delivery capability the Vietnam facility is also offering Bohle the possibility to focus more on the company’s 2nd brand; Impac. KMC’s Vietnam facility opened in 2015 produces 10 million chains a year of which some 9 million are shipped to motorcycle manufacturers. The remaining 1 million chains are sold to numerous OEM bike makers in the region which are focused on export to Europe. 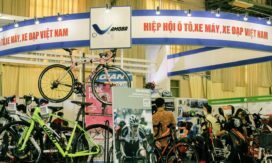 Vietnam is also a major exporter of bicycle and e-bike frames. Some 600,000 alloy and carbon frames are exported from Vietnam. 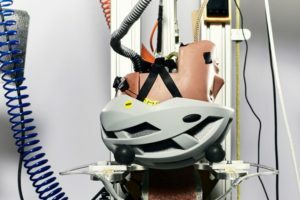 About 350,000 are shipped direct to bike makers in Europe. The rest goes to nearby bike makers in Cambodia where large scale makers like Strongman, A&J and Asama are located. Cambodian bike makers shipped close 1.3 million complete bikes to the EU countries in 2016. Next to alloy and carbon frames Vietnam also produces several hundred thousand steel bike frames of which also a big portion is shipped to Europe. Astro is one of the frame makers located in Vietnam that exports to Europe. The renowned Taiwan frame maker operates two facilities in Vietnam for the production of alloy and carbon frames. 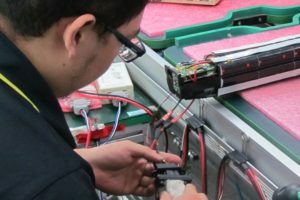 DDK is among the bicycle and e-bike component makers operating facilities in Vietnam. The company recently opened a new factory in the country for the production of memory foam. DDK’s new memory foam offers the same characteristics of gel but weighs less, is less vulnerable to vandalism, and doesn’t get hot in the sun. According to DDK this trend to develop memory foam with these characteristics is driven by the European e-bike market. Vietnam also holds a vital position as supplier of the bicycle producing facilities in nearby Cambodia. They are currently EU’s biggest supplier if regular bicycles. In the first six months of this year the EU imported 870,000 regular bicycles from Cambodia; up 6.7 percent on the same period of 2017. Taiwan’s export to the EU follows with 560,000 bicycles in the same period. That total export volume from Taiwan was down 23 percent on the same period last year. The EU also imported some 100,000 e-bikes from Vietnam/Cambodia in the first half of this year; up 14% on the total of last year’s first half. With that number the country is the 2nd biggest e-bike supplier of the EU after China. 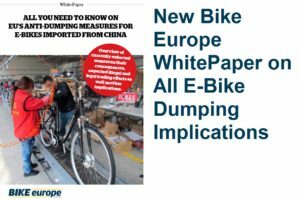 But, as China’s e-bike exporters are expected to be burdened with anti-dumping duties as of January 2019; it’s likely that Cambodia/Vietnam will turn into the biggest supplier of bikes and bike parts of the European Union. Whether these regular bicycles, e-bikes and parts and accessories are to be imported into the EU duty free as under the EU – Vietnam Free Trade Agreement, is at this moment questionable. In particular as signs are increasing that the deal might not be presented before the end of this year. As said labour and human rights in Vietnam are the big obstacle. Parties in the European Parliament are having lots of concerns about labor and human rights. Vietnam’s government had planned wide-ranging reforms ahead of its trade (TPP) deal with America, which would have improved working conditions for industrial workers. But when the United States withdrew from TPP, Vietnam canceled those reforms. All this results in increased signs that the deal might not be presented in time to be ratified before the end of this year.